This is the authentic Vietnamese Pho Ga recipe. I will show you step by step cooking instructions on how to make this South Vietnamese chicken noodle soup recipe. Pho Ga incorporates both French and Chinese influences but it is in fact the notational dish of Vietnam. Pho Ga is most often found in the Southern part of Vietnam. Vietnamese Bo Kho is a Beef Stew recipe that is often served on Egg noodles or with French Bread. This recipe shows you how to cook Bo Kho Vietnamese Recipe French/Vietnamese beef stew to perfection. Utilizing both French and Vietnamese cooking techniques this stew is one of my favorite breakfast foods. The slow cooked fatty Beef infused with charred Onion, Lemongrass, Ginger, Basil, Garlic and Carrot makes quite an incredible dish. Though I have never been in the North part of Vietnam I know in around Saigon this is a very popular dish. It takes time cook this recipe but it’s well worth it. It is most often served with a small bowl of salt and pepper to dip the tender meat into. And of course fresh bean sprouts, lime, sliced onion and fresh basil. When I eat this Bo Kho I like to add some extra fish sauce and hot sauce to bring the heat up on. Though sometimes it’s served with rice noodles, my favorite preparation is with egg noodles. I will show you step-by-step exactly how I watched Beninese people cook this recipe step by step. Though I am an American and people may say I’m doing it all wrong, this is what I saw. 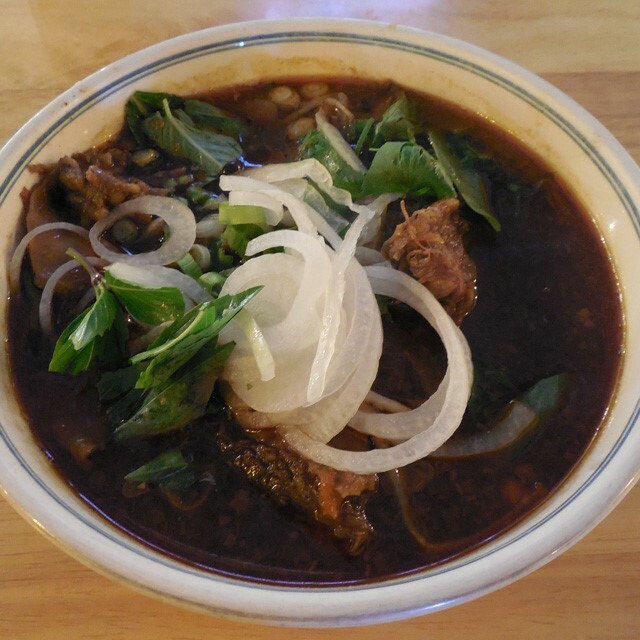 This is in fact what of my most favorite Vietnamese recipes In Vietnamese Bo means beef and Kho is to stew thus Bo Kho. This great stew from Vietnam takes about 3 hours to prepare and is worth the time. This dish ,Bo Kho has alot of French influences but is infused with many Vietnamese spices. Most often this stew is made from Beef Shank (bò bắp), or Beef Chuck (bắp vai bò) and is cooked until the meat is very tender, I like to Star Anise to make my stock when I am stewing my beef. After about an 1/2 hour into the cooling process I start to add the Fish sauce, and Tomato paste. Bo Kho is a great dish that gives you the true flavor of South Vietnam. On my trips to Saigon I have sampled Bo Kho at many fine restaurants in Saigon and in around the Delta. The time and dining experiences in Vietnam gave me the feel and taste for my own rendition of this classic dish Bo Kho . This is an easy dish to make and “you will love it” says The Bald Chef. Bo Kho is the perfect Vietnamese entrée. For more detailed information and cooking instructions Bo Kho is a great dish that gives you the true flavor of South Vietnam. On my many trips to Saigon I have sampled Bo Kho at many fine restaurants in Saigon and in around the Delta. The time and dinning experiences in Vietnam gave me the feel and taste for my own rendition of this classic dish Bo Kho . This is an easy dish to make and “you will love it” says The Bald Chef. Bo Kho is the perfect Vietnamese entrée. The Bald Chef shows you how to cook and prepare Vietnamese Bo Kho which is a beef stew that can be served on egg noodles or with French bread. In Vietnamese Bo means beef and Kho is to stew thus Bo Kho This great stew from Vietnam takes about 2 hours to prepare and is worth the time. Pho Gia is Vietnamese Pho soup made with chicken. Pho Gia Vietnamese Chicken Noodle Soup is made with white meat chicken This video will show you step by step how to make this South Vietnamese great soup recipe. In Vietnam you will find this soup in many street stalls all over the South part of Vietnam. Cooking this dish is easy and you will find the recipe to a be very authentic Vietnamese preparation. My experiences in Vietnamese restaurants both in Vietnam and the USA tells me after eating a bowl of this Pho Gia recipe it’s the real deal. The Bald Chef thinks that the key to his Pho Gia broth is to slow simmer the Pho broth, after the chicken has been removed. Chicken Pho is often served with sides such as Thai basil, bean sprouts, lime, and jalapeño slices. Vietnamese Summer Rolls are fresh, and almost like a salad in a rice paper roll. Sometimes Vietnamese (Gỏi Cuốn) Summer Roll Recipe rolls are called Imperial rolls because they are fit for a king. The Bald Chef uses Shrimp in this version, but try experimenting with Pork, chicken, basil, onion, mint, vermicelli, Sesame leaf, and lettuce. Pho(Phở Bò) the national dish of Vietnam . Vietnam Pho Soup Siagon Recipe (Phở Bò) recipe will show you step-by-step how to make this incredibly famous soup from southern Vietnam. Pho is a incredibly delicious Vietnamese beef soup. Pho Is the greatest hangover cure known to man, and is said to have medicinal properties. This is my Pho recipe, by the Bald Chef (Glen Izett) is made the way Pho is made in Saigon, Vietnam. Though making Pho is not a quick process, it is well worth the time. This fragrant soup is made from a combination of many cuisines including French, Chinese, and indigenous the Vietnamese cooking techniques. The quintessential part of cooking up the broth for the soup is to make a very clear stock. The stock is flavored with some of the southeastern Asians best spices, and poured over rice noodles, and topped off with a variety of vegetable accoutrements. 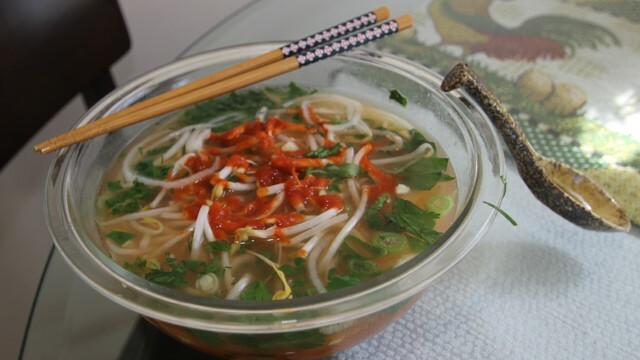 Many Americans call this dish pho but in Vietnam it is called (fuh). 6 tablespoons of fish sauce (nuoc mam) I recommend 3 crab brand fish sauce. Vietnamese Shaking Beef or in Vietnamese Bò Lúc Lắc is one of my favorite recipes from Vietnam. This recipe is basically a grilled beef salad, that uses watercress, cucumber, tomato, and a homemade dressing.